When I enter the modest home of Marhaf Homsi and his wife Nawal, they sit me down and serve me a platter of homemade cookies and a glass mug full of milky black tea. Marhaf and Nawal own Sweet Syrian Refuge, a small baking business they operate out of their Bay Ridge apartment. In the Syrian city of Hama, they ran a bakery for over 30 years making fresh bread, cookies, and wedding cakes, even as bullets whizzed passed their windows and bombs exploded in the neighboring streets. After trying to flee Syria for three frustrating years, the couple finally entered the United States as refugees on March 31, 2016. Once they resettled in Brooklyn, Marhaf and Nawal, both in their 70’s, began to start over with the support of their oldest son, Yamen, who had emigrated after meeting his American wife, Bernadette. The couple became determined to rebuild their baking business in the United States, even if it meant cooking out of the small kitchen in their new apartment. Unable to eat all of the baklava that Marhaf and Nawal were baking at home, Bernadette, a PhD student, started bringing boxes of pastry with her to school to share with her peers. Through a chain of Bernadette’s classroom friends, pastry samples made their way into the hands of a New York Times staffer. A few weeks later, Marhaf and Newal landed on the front page of the New York Times Food section. “We got about 900 orders in the first few weeks after the article came out,” Bernadette said. “We were completely overwhelmed. Marhaf and Nawal were working nonstop.” Marhaf and Nawal had been frequenting outdoor markets to sell their goods and spread the word until they set up the Syrian Sweet Refuge e-commerce site. With their full-fledged business back up and running, the Homsis are looking for a commercial kitchen space with the goal of opening a storefront bakery. Bernadette’s husband arrives with their baby in tow and suddenly there is laughter and hugging and cooing from Marhaf and Nawal. In the midst of the commotion, Nawal pauses to ask me why I haven’t finished the plate of baklava she’s placed in front of me. I smile and bite into the flaky pastry, studded with walnuts and scented with orange blossom water. It’s barely sweet, just how I like it. 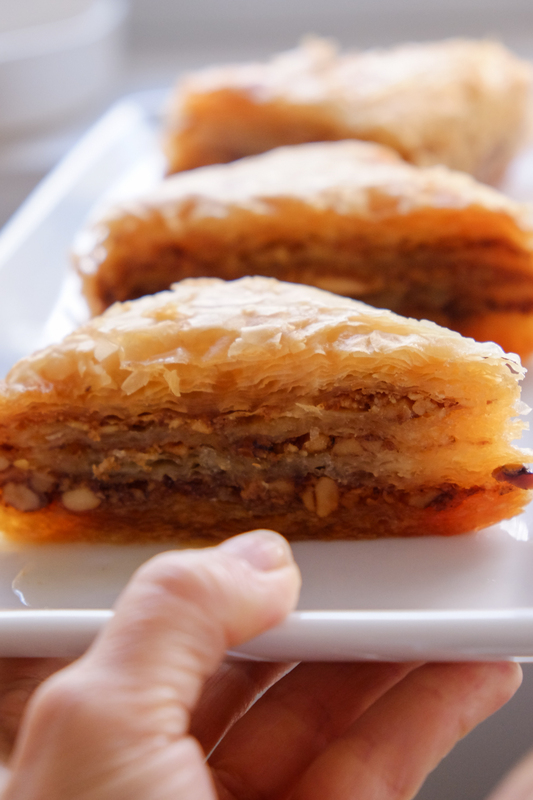 I agree with Marhaf when he says that most of the baklava I’ve eaten in America is not very good—not until now.